Wrap and Snap Choke Free Dog Harness by Doggie Design - Maui Pink Customer Photos - Send us your photo! 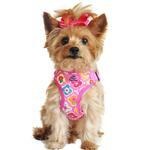 Our precious Dusty is giving a wink in pink...that is in her Maui Pink Wrap and Snap harness that just arrived today. "I am definitely going to look so fashionable wearing my BaxterBoo hoodies with new harness!" Posted On 04/04/19 by Cathy Ann K from , NJ Yes, Cathy Ann K recommends this product! Love this harness! I bought the size suggested for my Chihuahua/terrier's uweight and chest size (medium) and, once adjusted, it fits perfectly. It is so soft and comfortable, unlike her old harness which had straps and metal rings. I would definitely recommend purchasing this harness if you care about your dog's comfort and safety, as we do. Posted On 03/11/19 by Heather from Amarillo, TX Yes, Heather recommends this product! I love this but it's 4 stars because it runs small and is not adjustable. Posted On 06/30/18 by erika g from Haverhill , MA Yes, erika g recommends this product! Posted On 06/13/18 by Susan G from West Lawn, PA Yes, Susan G recommends this product! 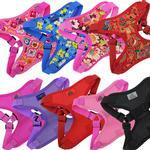 With summer cuts we especially need well-fitting harnesses and ones that don't irritate skin. Our bichipoo does well with this type and looks adorable while staying safe! Posted On 05/10/18 by Alina R from , CA Yes, Alina R recommends this product! This harness is so adorable on my puppy! The coloring stands out and it's very sturdy. The one thing I would change is to make it a little more adjustable, but it's still a nice harness. Posted On 03/24/18 by erika g from Haverhill, MA Yes, erika g recommends this product! These are so cute and there’s no way my wiggly little yorkie can break free from it! Posted On 10/31/17 by Eileen B from Deerfield Beach, FL Yes, Eileen B recommends this product! Posted On 08/27/17 by Lisa f from Los Angeles, CA Yes, Lisa f recommends this product! This harness is adorable; the pink multi-colors compliment my dog's coloring and everyone knows she's a girl :) I especially like that it won't harm her trachea..get one! Posted On 08/26/17 by Joy S from Hale, MI Yes, Joy S recommends this product! This harness is too cute?? My little Frenchie loves it! I bought the extra small at first and that was too small. I ordered the small and that was too big. It seems that there should be a size in between. My dog is a 5 pound Morkie. Posted On 08/17/17 by Cindy C from Mattoon , IL Yes, Cindy C recommends this product! Love this harness!! Perfect fit and so cute on! Posted On 07/08/17 by Tenneill J from , Yes, Tenneill J recommends this product! Posted On 07/06/17 by Diane G from , Yes, Diane G recommends this product! This harness is so awesome that I ordered it in a second pattern. The snap clasp is very secure and double D-rings to hook the leash adds more security. My little chihuahua walks so much more happily with this harness. Highly recommend! Posted On 04/13/17 by Sharon Meharg from To ky, OK Yes, Sharon Meharg recommends this product! Posted On 04/08/17 by Christine G. B from West Linn, OR Yes, Christine G. B recommends this product! My doggie loves this very well made and festive summer harness! Posted On 02/28/17 by Sharon L from SLC, UT Yes, Sharon L recommends this product! This harness is adorable but unfortunately, too small for my dog. I have ordered a larger size and am returning this one. Posted On 02/27/17 by Claudette D from Pinckney, MI Yes, Claudette D recommends this product! Very Good quality. Great color. I ordered it to small, so I'm sending back and ordering bigger size. Posted On 01/31/17 by Sonya K from Lynwood, IL Yes, Sonya K recommends this product! This harness is just what I needed for my little Yorkie girl. Since the regular collars are so dangerous for their fragile necks, this choke free harness is not only safe, but also sturdy and dependable. And the bright colors help her to be fashinable :-) The size was also perfect for her. I am very impressed with this purchase and plan to buy more of them. Posted On 12/22/16 by J.S. from , PA Yes, J.S. recommends this product! Beautiful colors and looks great on my Maltese! Posted On 11/04/16 by Antonia D from Port Saint Lucie, FL Yes, Antonia D recommends this product! This is one of the best harnesses that we got our dog. Is fits our little chihuahua perfectly. Posted On 10/30/16 by Paula H from , KY Yes, Paula H recommends this product! This sweet pink harness is perfect for my yorkie baby. It keeps her secure without the pressure on her neck that a collar would cause (very important for fragile puppies). Posted On 09/10/16 by Linda W from Auburn, WA Yes, Linda W recommends this product! I love this harness it's easy to get on and is really cute. Posted On 06/08/16 by Barbara P from Roscommon, MI Yes, Barbara P recommends this product! Great little harness! However my dog was out of it in 5 min. I'd recommend it to anyone whose dog would leave it on! Posted On 06/02/16 by M.J. from , Yes, M.J. recommends this product! I measured my pup and went by the size guide, but when the harness arrived, it was too small. It is super cute, and appears great for summer, so I'm planning to return it and re-order the next size up! Posted On 05/09/16 by Jamie M from , MN Yes, Jamie M recommends this product! I am very happy with this harness. The sizing chart was correct and the x-small fit my dog perfectly. Posted On 04/27/16 by Dorothy S from Howard Beach, NY Yes, Dorothy S recommends this product! Posted On 04/13/16 by Linda C from Riverside, RI Yes, Linda C recommends this product! 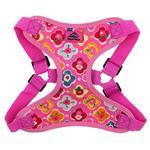 Great summer harness. Keeps my Pup cool in the warm summer months. Posted On 03/14/16 by Debbie P from Bridgman, MI Yes, Debbie P recommends this product!